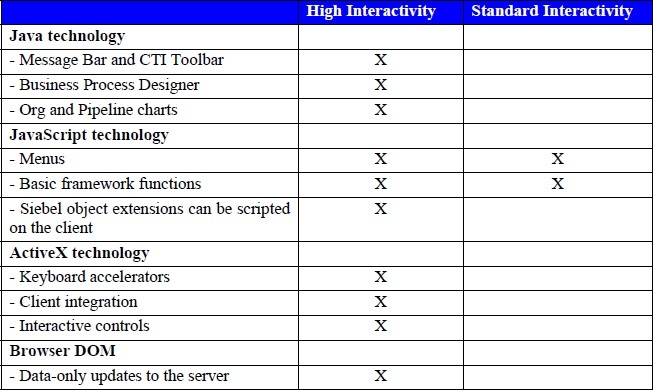 The high interactivity client framework is ideal for task-intensive, employee-facing applications, such as Siebel Call Center, Sales, Service, and Marketing. It improves user interface response time while maintaining the benefits of a completely Web-based client. It is easy to deploy and it does not require specific Siebel eBusiness application configuration changes. The browser document object model (DOM) is the foundation for the Siebel HI framework. The DOM provides a standard way to programmatically build, navigate, or update the user interface. 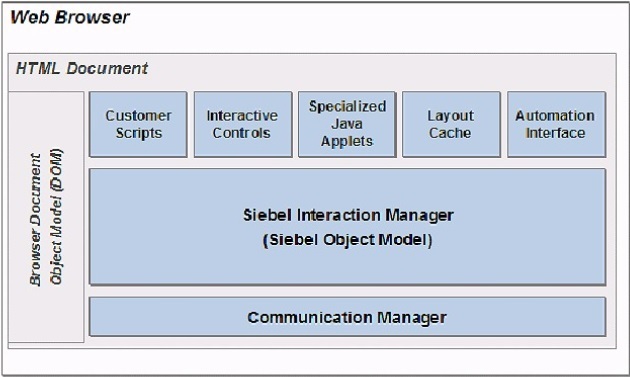 The Siebel high interactivity framework uses advanced browser feature such as the DOM, Java, and ActiveX. Because the HI framework requires these technologies, only specific browsers and platforms can run Siebel eBusiness applications in HI mode. Use the Siebel System Requirements and Supported Platforms Guide to identify the latest platform and browser support information.